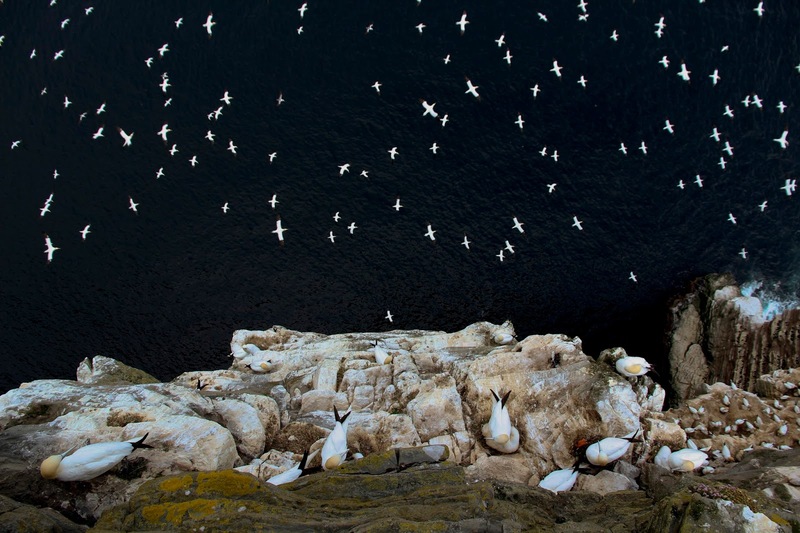 ‘On the Edge’ of gannets on a cliff, by Barrie Williams. The wonderful image of gannets from the BWPA is a deserved winner, the white birds standing out against the deep inky sea far below the solid ground on which the photographer stood to capture the image, although maybe not so good for anyone with vertigo! I remember looking down on all the seabirds at St Abbs Head and it was an amazing sight: to be looking down on the backs of the birds when usually you're looking up at the sky and seeing their underwings and feet. I don't know if it was the sheer number of birds or if it was really the first time I'd looked down on birds in flight but it felt like a new vision. The world shifted on its axis to show us a new vista, a different perspective. I can't quite believe that growing in Whitby walking along those tall cliffs virtually every day I had never looked down but it was familiar and perhaps I simply never saw what was going on right under my nose (feet?)? This incredible image kept appearing across the many news feeds we read every day and in blogs and tweets mostly in little thumbnails which gave it totally different aspect. 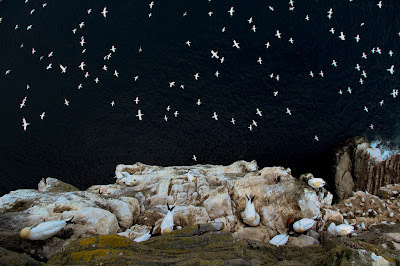 Just like looking down on the birds at St Abbs the image seemed shifted, the tall rocky cliffs are the solid ground and the inky seas become the velvety depths of the night sky, the little white birds transformed into many stars set into avian constellations. A reminder that what we think we see (or hear) is maybe not really what's there in front of our eyes and is deserving of a second look.